Conserve Water and Stop Pollution! 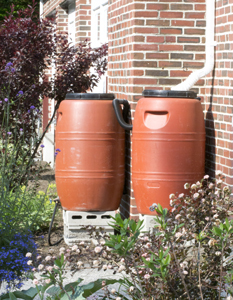 As part of National Drinking Water Week and Clean Water Week, PWD partners directly with the manufacturer to offer discounted rain barrels at $60 (plus $3.30 tax). This is more than 50% off the retail price of $125! Rain barrels are a great way to conserve water and reduce pollution! Rain water collected from your roof can be used to water lawns, gardens, and indoor plants. Fully screened intake port keeps mosquitoes, insects, & debris out. Removable lid provides easy access to clean or fill watering cans. Overflow connector and tubing allows water to be directed away from the foundation or to join multiple barrels. Solid brass threaded spigot can be connected to a regular hose or soaker hose. Great storage place for hoses in the off season. Can be used with or without gutters. For use without gutters, you will need a location where water concentrates and flows off a roof. Elevate your barrel for easy access to the spigot. Saturday, June 1, 9:00 a.m. – 12:00 p.m.
Tuesday, June 4, 5:00 p.m. – 6:00 p.m.
Wednesday, June 5, 5:00 p.m. – 6:00 p.m. The facility is located at the end of Marginal Way under Tukey’s Bridge. Friday, June 14, 8:00 a.m. - 4:30 p.m. The Sebago Lake Ecology Center is located at the intersection of Routes 35 and 237 in Standish. Trouble Ordering? Please click here for help with PayPal. Common errors include credit card verification, guest sign in limits (10 times or $4,000 in purchases), and trying to pay as a guest when you have a PayPal account. Rain barrels are not a creditworthy management system under the current credit manual.